At Munkedal Skog youll have the opportunity to fish in various waters, including lake, river and sea. We have access to various lakes of different sizes and varying fish species. The Örekilsälven River that you can hear from our facility is one of the countrys best salmon waters. Here you will stay in an elegant estate setting dating back to the 1800s. We offer excellent service and savoury food. Your rooms are clean and offer hotel standard. At Munkedal Skog & Event we speak Swedish and English. 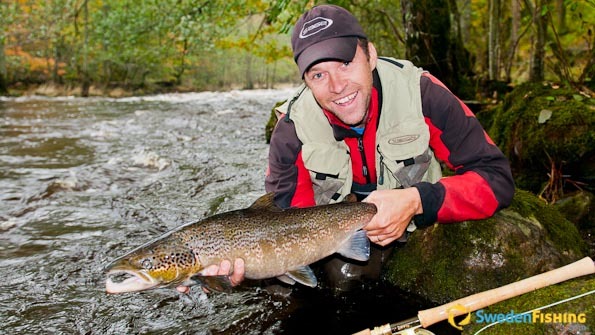 May 15 through September 15 is season for salmon and brown trout in the Örekilsälven River. Lake fishing can be arranged all year, though we recommend spring and autumn for pike and rainbow trout. If the weather co-operates we can also arrange ice-fishing. You can combine your fishing experience at our estate with several other activities. It is possible to hunt, either on our own hunting lands or in our deer pasture. We can arrange wine tastings before the excellent dinner. 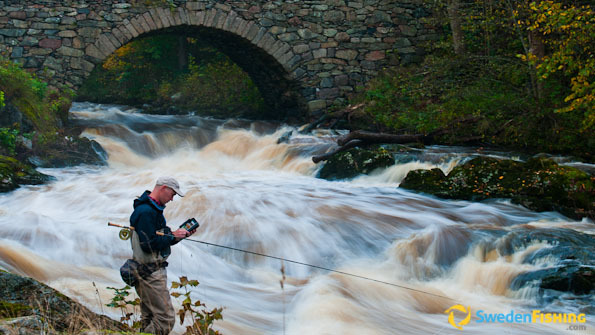 We welcome all angler to the inland waters of west Sweden and the rapids of river Örekilsälven! Öreskilsälven River: biggest salmon in 2011 weighed 17.4 kg. Lakes: pikeperch, pike, perch plus other species. We have stocked one of our lakes with rainbow trout, grayling and brown trout. Here you can combine fishing with elegant living and superbly prepared food at the Manor. We can offer high quality guiding and tasty food in the field if requested. For fishing on our lakes we offer four rowboats intended for two or three persons per boat. Fishing for salmon in the Örekilsälven River is done with spin or fly-fishing. During the summer lake fishing is done from a boat using with spin equipment. You can also fly-fish for rainbow salmon in lovely Lake Harkerudsjö. Ice-fishing for rainbow, pike or perch is done either with Tip-ups, ice-angling or handheld jig fishing. The equipment needed can be borrowed as needed. With the exception of occasional trophy or food fishes, all fishing is Catch & Release. However, all salmon and brown trout under 45 cm must be released. 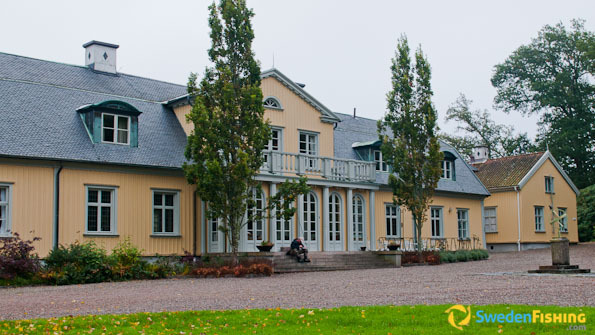 We can offer high quality accommodations at our manor, located handsomely next to the Munkedalsälven River. You will live in either single or double rooms of hotel class. Of a total of 28 beds, five of our 15 rooms are located in a wing next to the manor house where there is a possibility for self-catering for as many as 10 persons. Our restaurant holds high class, offering good quality food and drinks. Though our reputation is based on deer meat from our own pasture, the menu can be altered to taste. We can also serve wine or beer with our meals. More basic accommodations can be offered in a small, timbered cottage with space for four persons. It is electrified, but has no water. Self-catering is the order of the day and you must bring your own bedding and clean up afterwards. We are located around 100 km north of Göteborg, just outside the village of Munkedal near river Munkedalsälven. By car the trip from Göteborg takes around an hour. The Munkedal train station is 4 km away  we can arrange to pick you up there.